Next week, the National Park Service (NPS) is celebrating the centennial of its founding as a new federal bureau with the central task of overseeing and preserving our National Parks. Forty-four years after President Grant created the country's--and the world's--first national park, Yellowstone, responsibility for all the parks' oversight and protection was scattered and dubious. When President Woodrow Wilson signed the act on August 25, 1916, there were 14 national parks and 21 national monuments that needed tending, and finally there was one agency that could do it. This was America's best idea, and it just got greater and bigger. Now there are over 400 areas that are under the purview of the NPS--the 59 national parks as well as monuments, battlefields, military parks, historical parks, historic sites, lakeshores, seashores, recreation areas, scenic rivers and trails, as well as the White House. Busy, busy, busy! 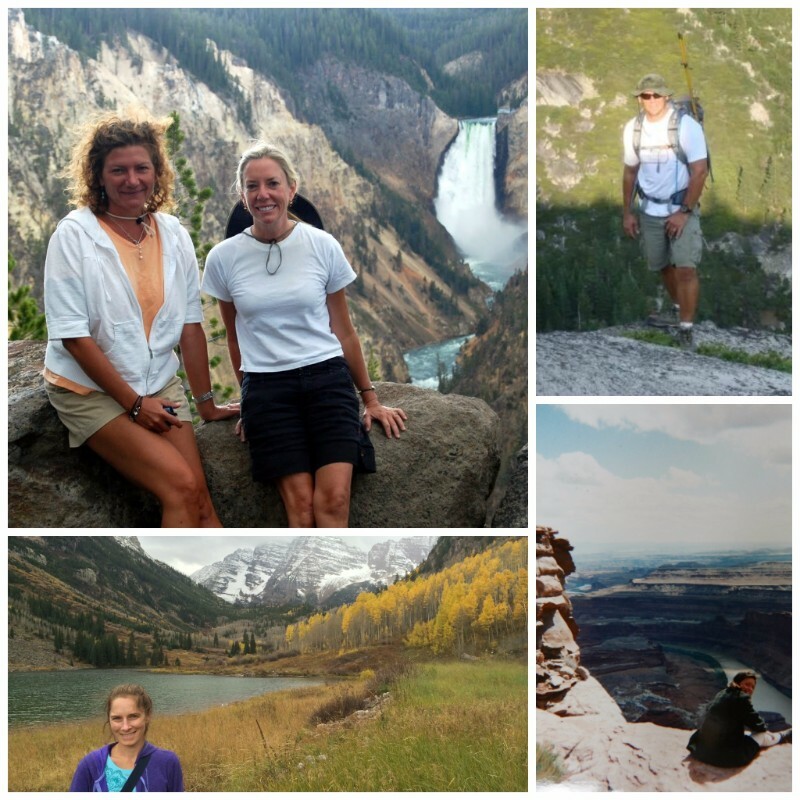 Clockwise from top L: Kimber & Lois at Yellowstone Nat'l Park, Bill at Yosemite Nat'l Park, Keelin at Grand Canyon Nat'l Park, and Ellery at White River Nat'l Forest (scroll down for more). The initial 14 national parks consisted of vast diverse landscapes, all west of the Mississippi. These were established primarily to protect scenic wonders--soaring cliffs, canyons, glaciers, waterfalls. These were places that were not considered to have huge development potential; they were too severe. Plus, there was a sense of patriotic pride in these natural cathedrals that could rival any of the man-made castles and cathedrals of Europe. They were to be open to the public for everyone to enjoy, not just wealthy recreationalists and game hunters. Protection of living creatures such as the American buffalo in Yellowstone and the giant redwoods in Yosemite and Sequoia & Kings Canyon National Parks became a priority, and later protection of wildlife in general became a goal. Now our national parks have the incredible goals of protecting natural biodiversity--ecosystems, indigenous flora and fauna, geosystems--while inspiring our awe as well as our imagination of what life was like before cars and computers. As national park advocate and Sierra Club founder John Muir said, "Everybody needs beauty as well as bread, places to play in and pray in, where nature may heal and give strength to body and soul." Our parks not only tell the American story--they help create it, and we are their only stewards. Have you found your park? The NPS manages half a dozen sites in South Carolina: Ft. Sumter Nat'l Monument (which includes Ft. Moultrie), Charles Pinckney Nat'l Historic Site, Cowpens Nat'l Battlefield, Ninety Six Nat'l Historic Site, King's Mountain Nat'l Military Park as well as the state's only national park, Congaree National Park. How many of these sites have y'all visited? If you have a Nat'l Parks Passport, you've probably been to most of them since those stamps and stickers are hard to resist! Only 34 states have national parks in them and less than a third of all national parks are east of the Mississippi--so South Carolina should consider itself somewhat special (well, in fairness, we already do!). Earning the designation of national park is not easy to get as it requires acts of Congress, but a Presidential declaration can establish a national monument--if the land is already owned by the federal government. National monuments have historical, cultural or scientific interest while national parks require at least 2,500 acres of land to ensure enough area for recreation and biodiversity. It has not been uncommon for national monuments to be redesignated to national park status--it takes some work but the payoff is, in part, better protection and preservation as well as additional funding. Do y'all know the story of how South Carolina got its own national park? (L-R) John Cely, Jim Elder, & Dr. James Tanner were instrumental in exploring Congaree Swamp and organizing the movement to preserve it. Okay, first things first: it's not really a swamp because it doesn't have standing water most of the time. It's actually a floodplain forest that floods about ten times a year, but the local name makes sense. Congaree was named after the Native American tribe that lived in the area; they were decimated by an outbreak of smallpox in the 18th century that was spread by European settlers. While the land was pretty inhospitable, the regular flooding did make the soil rich. There is evidence that some tried to farm the land using dike systems, and 'mounts' of earth were built to provide high ground to livestock during big floods. The dense wet forests did provide a somewhat safe haven for many escaped slaves who stayed on there after the war, and there are a number of scary 'tales' of the swamp passed down over the generations (sorry, kids, no haint stories today, but if you're interested, check out Tales of the Congaree by Edward C. L. Adams). After the Civil War, a timber tycoon from Chicago named Francis Beidler bought up hundreds of thousands of acres of dirt-cheap South Carolina timberland. Since getting in and out of the Beidler Tract (the area that is now the national park) proved to be so difficult and dangerous, logging there was abandoned. The river bottom hardwood forest includes tall stands of bald cypress and tupelo in the wetter areas, as well as over 80 other tree species, including sweetgum, various oaks, and giant loblolly pine. Beidler could have sold off his old-growth forests and moved on to where timbering was easier, but he chose instead to hold on to the land, knowing that old-growth timber was being harvested at a rapid clip elsewhere and time would only add value to his land. But his decision to put the land into what some refer to as "timber reserve" status is why we have a national park today. The earliest ideas of making the Congaree Swamp a preserve came in the 1950s from Harry R. E. Hampton, who spent a great deal of time in the wet forest as a member of the Cedar Creek Hunt Club. Hampton was an editor at The State newspaper in Columbia and persuaded his friend Peter Manigault at the Post and Courier in Charleston to help him publicize the natural beauty and value of the land. Hampton appealed to various governmental agencies to find ways to have the Beidler Tract preserved as public land. The Southeastern Office of the National Park Service conducted a suitability study, published in 1963, recommending that the area should be "favorably considered" as a national monument for its ecological and geological significance. Throughout the 60s, naturalists studied the ecology and geology of the forest--including many state and national record holding trees--some were calling this the Redwoods of the East! In 1969, Beidler's descendants began leasing harvesting rights to the forest--remember, this is still private land--and people went nuts! In comparison to the fight to save the giant Redwoods, which took some 50 years, the fight to save Congaree's giant cypress, tupelos, and longleaf pines was relatively quick. 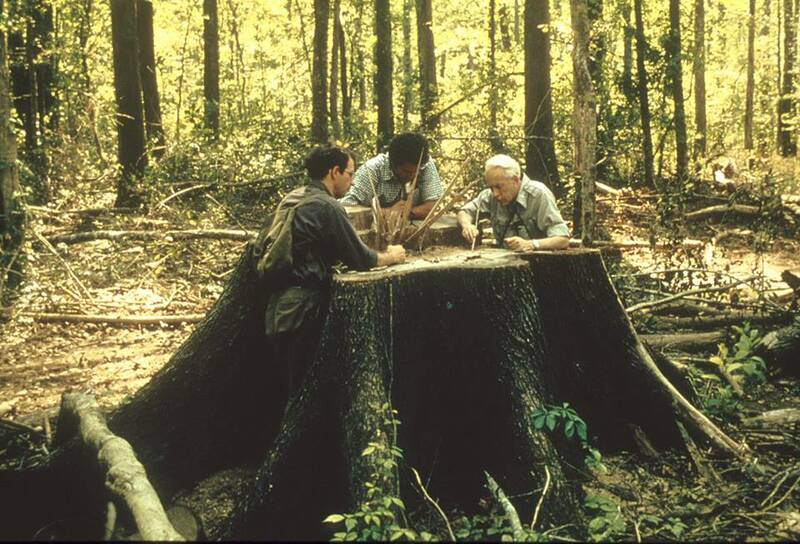 In 1972, the Congaree Swamp National Preserve Association launched a highly successful public awareness campaign. In 1975, they held a "Congaree Action Now!" rally in Columbia that drew about 700 people. Literal tree-huggers in South Carolina? Yes, we did. Of course, there were many who were against protecting the land and trees, and not without viable concerns. Since this was private land, efforts to buy and preserve it had to be approved by Congress. 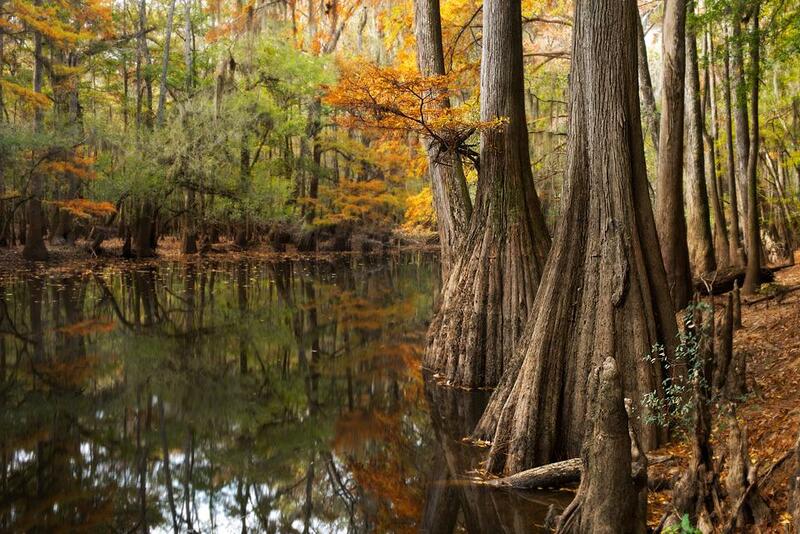 Senators Strom Thurmond and Fritz Hollings were very effective on this: on September 21, 1976 (just a year after the rally), Congress passed the act establishing Congaree Swamp National Monument and a month later, President Ford signed it. But don't go feeling sorry for the Beidler heirs, y'all--they were compensated with over $30 million dollars and some nice tax credits. In 2003, 'swamp' was dropped from its name when it was reassigned as Congaree National Park. The park now has more than two dozen record-breaking trees, and they all want hugs. See y'all at Congaree! 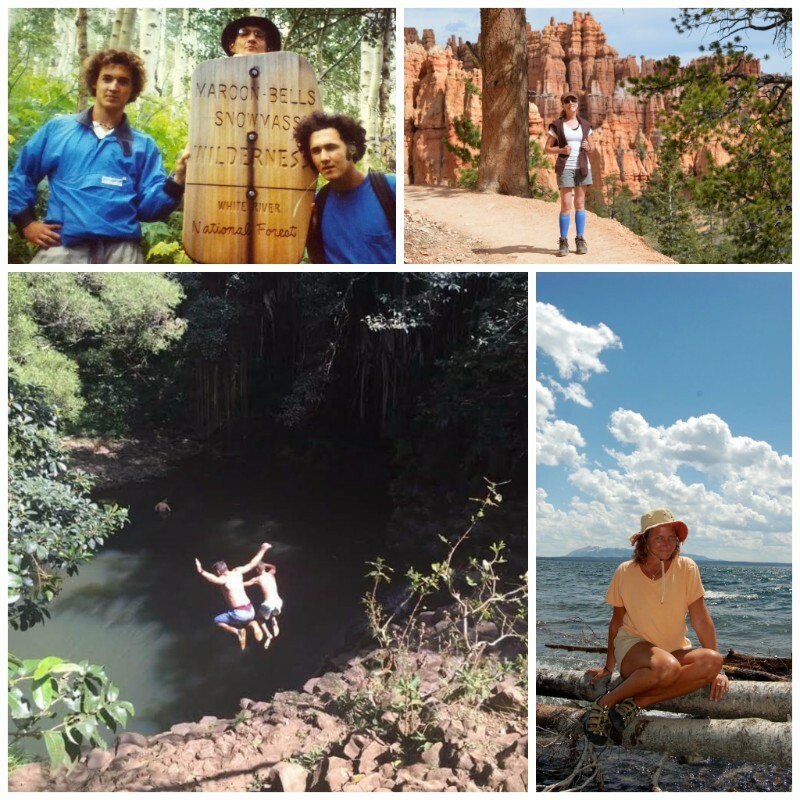 Clockwise from top L: John with his father and brother in White River Nat'l Forest, Lois in Bryce Canyon Nat'l Park, Kimber in Yellowstone Nat'l Park, and Bill with his son Jack in Haleakalala Nat'l Park.